you can lazily use the Query Table menu item. this surely is quickest and easiest way, completely user friendly. you simply have to click the mouse's right button over the required table, so to make the context menu to be shown. then you can simply use the lowermost buttons in order to scroll the result-set back and forth at your will. anyway, this approach is rather mechanical, and doesn't allow you to exploit SQL at the best of its powerful capabilities. alternatively you can hand-write any arbitrary SQL statement into the uppermost pane, then pressing the Execute button. but this way you can take full profit of the impressive SQL unconstrained fire power. You surely noticed in the above illustration that Geometry columns simply reports an anonymous BLOB GEOMETRY: this is far to be satisfactory. But you can get a much richer preview of any Geometry simply clicking the mouse's right button over the corresponding value, then selecting the BLOB explore menu item. 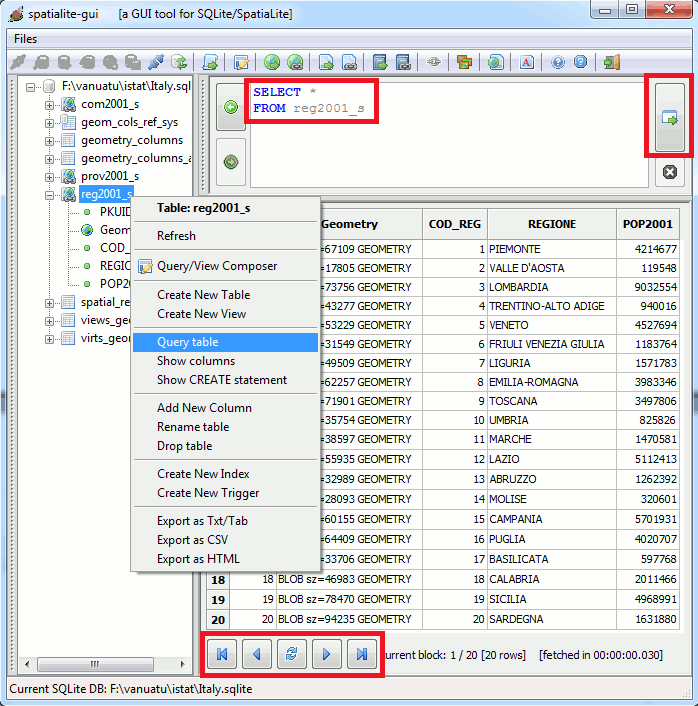 You can test how free-hand SQL works using this SQL statement: simply copy the above SQL statement, then paste into the query pane, and finally press the Execute button. but you can simply trust to my authority just for now. COL002 contains the name of each populated places. COL006 contains the corresponding longitude	(expressed in decimal degrees). MakePoint() is a Spatial function building a point-like Geometry from corresponding coordinates. 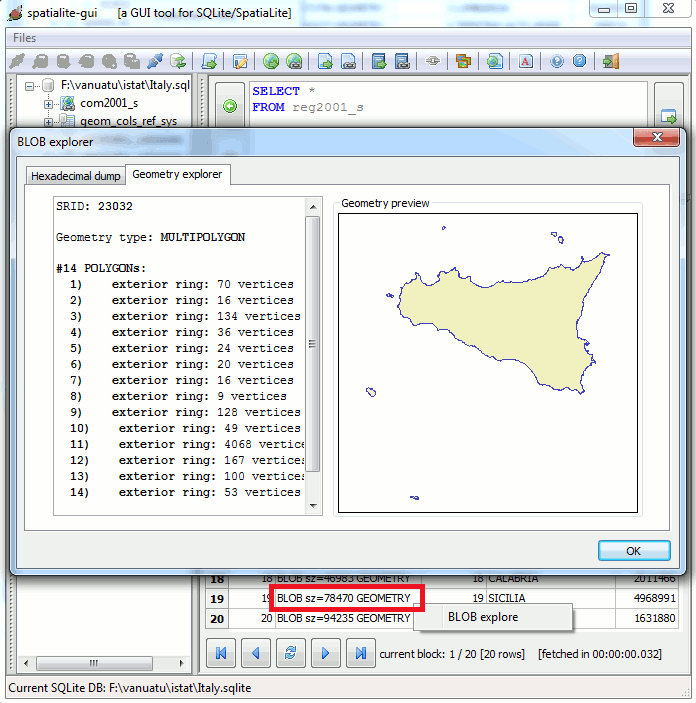 very simply said, the WHERE clause will filter the result-set so to exclude all places outside Italy. All right, you are now supposed to be able to really start working seriously. 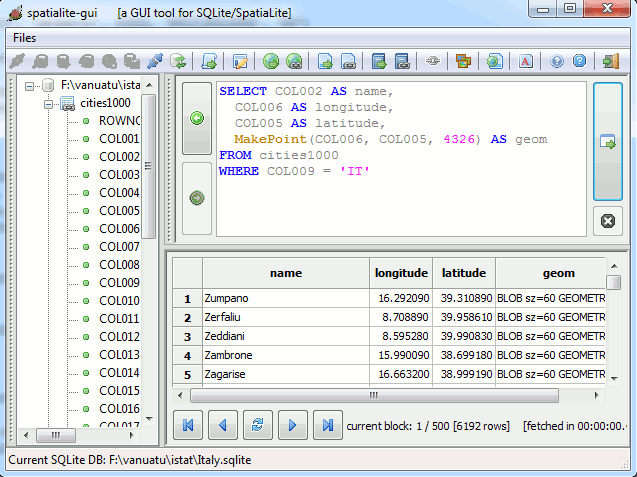 In the next slides we'll start exploring the mystery world of SQL and Spatial SQL.